That’s what the 2018 Boston Red Sox are. Etched indelibly in stone. Ousting the Dodgers in a brief but memorable five games, this baseball team seriously warrants discussion as one of the best teams of all time. On the strength of elite pitching, surgical defense, and explosive offense, Boston dusted Los Angeles after just five games, in Vin Scully’s house, no less. The Red Sox dominated and demoralized the Dodgers in every way in this year’s Fall Classic. I mean it literally took LA 18-innings, in the longest World Series contest ever played, just to win one game. Then there was the tremendous, almost mythological pitching of David Price, called upon to show up as everything to everyone this post season. Whether it was pouncing on future Hall of Famer Clayton Kershaw in Games 1 and 5, or their staggering 108-win regular season, the Red Sox left no doubt about who they are. 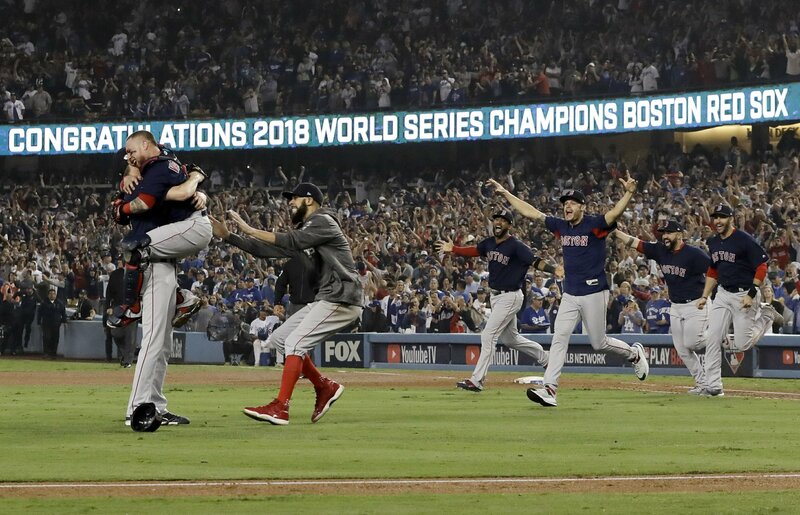 Since their improbable 2004 championship run, Boston has added three more world championships; coming in 2007, 2014, and the latest just a few days ago. That’s the peculiar aspect though, because this dynasty is new money. The days of the “cursed” Red Sox and images of 80+ years of failure since 1918, still burn vividly in our minds. Because of this, I think you must consider Boston an elite franchise with an underdog mentality. Just observe the construct of this baseball team: Dave Dombrowski came from Detroit and essentially transplanted the 2014 Tigers into Fenway Park, where suddenly it all clicked. In the past, Ian Kinsler, J.D. Martinez, Rick Porcello, and David Price, all exhibited their own unique take on choking while donning the “Old English D.” But not here. Perhaps the trauma they endured with then Tigers’ manager, and current Angels’ skipper, Brad Ausmus, was enough to extricate their losing ways and begin anew. Who knows? Alex Cora probably knew, and all he did in his first year as manger was win the game’s biggest prize. So, he’s got that working in his favor. Another favorable element of this team seems to be its on-field chemistry. They root for each other. 2018 World Series’ MVP and first-baseman, Steve Pearce’s 11-year journey to this pinnacle, helped inspire the team and helped to get players the motivation needed to step up and truly become Major League Baseball’s best team in 2018. You can’t win 108 games in the regular season, only to book early tee times in October. And they didn’t. This club possesses the willingness to work. They navigated the vaunted AL East, and achieved success in the face of national analysts predicting a repeat for 2017 champion Houston Astros. That’s what I mean when I say this franchise operates as underdogs. Assume nothing is given, then take it all. The world over, this team will be remembered for the long bombs by Jackie Bradley Jr. They’ll be remembered for the fleet-footed base-running of Mookie Betts. But most of all, perhaps, they’ll be remembered for the attitude and work ethic to make it all possible. Congratulations to the 2018 World Series champs. Well done, gentleman.